For the Flaming Lips song, see Approaching Pavonis Mons by Balloon (Utopia Planitia). Utopia Planitia (Greek and Latin: "Nowhere Land Plain"—loosely, the plain of paradise) is a large plain within Utopia, the largest recognized impact basin on Mars[a] and in the Solar System with an estimated diameter of 3,300 km. 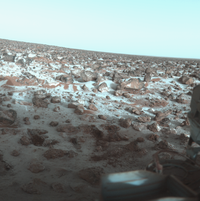 It is the Martian region where the Viking 2 lander touched down and began exploring on September 3, 1976. It is located at the antipode of Argyre Planitia, centered at 46°42′N 117°30′E﻿ / ﻿46.7°N 117.5°E﻿ / 46.7; 117.5. It is also in the Casius quadrangle, Amenthes quadrangle, and the Cebrenia quadrangle of Mars. Many rocks at Utopia Planitia appear perched, as if wind removed much of the soil at their bases. A hard surface crust is formed by solutions of minerals moving up through soil and evaporating at the surface. Some areas of the surface exhibit what is called "scalloped topography", a surface that seems to have been carved out by an ice cream scoop. This surface is thought to have formed by the degradation of an ice-rich permafrost. Scalloped ground, as seen by HiRISE under HiWish program. A study published in Icarus, found that the landforms of scalloped topography can be made by the subsurface loss of water ice by sublimation under current Martian climate conditions. Their model predicts similar shapes when the ground has large amounts of pure ice, up to many tens of meters in depth. Close up of scalloped ground, as seen by HiRISE under HiWish program. Surface is divided into polygons; these forms are common where ground freezes and thaws. Note: this is an enlargement of a previous image. Low center polygons, shown with arrows, as seen by HiRISE under HiWish program Location is Casius quadrangle. Image was enlarged with HiView. Low center polygons, as seen by HiRISE under HiWish program Location is Casius quadrangle. Image enlarged with HiView. Holes and hollows on crater floor in Utopia Planitia, as seen by HiRISE under HiWIsh program. These shapes may have resulted from ice leaving the ground. Glacier on a crater floor, as seen by HiRISE under HiWish program The cracks in the glacier may be crevasses. There is also a gully system on the crater wall. Context for next image of layers along Hrad Vallis, as seen by CTX. Photo labeled with layers, streamlined forms, and arrow indicating direction water flowed. In the Star Trek media franchise, Utopia Planitia—both on Mars' surface and in areosynchronous orbit above it—is the site of a major Federation shipyard. Ships such as the USS Enterprise-D, USS Defiant, USS Voyager and USS Sao Paulo were built there. The Flaming Lips song "Approaching Pavonis Mons by Balloon (Utopia Planitia)" was released in 2002 on the album Yoshimi Battles the Pink Robots. ^ Officially, Utopia is an albedo feature. ^ a b "Utopia Planitia". Gazetteer of Planetary Nomenclature. USGS Astrogeology Science Center. Archived from the original on 2016-12-19. Retrieved 2015-03-10. ^ "Utopia". Gazetteer of Planetary Nomenclature. USGS Astrogeology Science Center. Archived from the original on 2012-12-14. Retrieved 2016-03-26. ^ McGill, G. E. (1989-03-10). "Buried topography of Utopia, Mars: Persistence of a giant impact depression". Journal of Geophysical Research. 94: 2753–2759. Bibcode:1989JGR....94.2753M. doi:10.1029/JB094iB03p02753. ^ Sejourne, A. et al. 2012. Evidence of an eolian ice-rich and stratified permafrost in Utopia Planitia, Mars. Icarus. 60:248-254. ^ Lefort, A.; Russell, P. S.; Thomas, N.; McEwen, A. S.; Dundas, C. M.; Kirk, R. L. (2009). "Observations of periglacial landforms in Utopia Planitia with the High Resolution Imaging Science Experiment (HiRISE)". Journal of Geophysical Research. 114 (E4). Bibcode:2009JGRE..114.4005L. doi:10.1029/2008JE003264. ^ Morgenstern, A; Hauber, E; Reiss, D; van Gasselt, S; Grosse, G; Schirrmeister, L (2007). "Deposition and degradation of a volatile-rich layer in Utopia Planitia, and implications for climate history on Mars" (PDF). Journal of Geophysical Research: Planets. 112 (E6): E06010. Bibcode:2007JGRE..112.6010M. doi:10.1029/2006JE002869. Archived from the original (PDF) on 2011-10-04. ^ Dundas, C., S. Bryrne, A. McEwen. 2015. Modeling the development of martian sublimation thermokarst landforms. Icarus: 262, 154-169. ^ Kostama, V.-P., M. Kreslavsky, Head, J. 2006. Recent high-latitude icy mantle in the northern plains of Mars: Characteristics and ages of emplacement. Geophys. Res. Lett. 33 (L11201). doi:10.1029/2006GL025946. ^ Mustard, J., et al. 2001. Evidence for recent climate change on Mars from the identification of youthful near-surface ground ice. Nature 412 (6845), 411–414. ^ a b Okuda, Michael; Denise Okuda & Debbie Mirek (1999). The Star Trek Encyclopedia. Pocket Books. ISBN 0-671-53609-5.